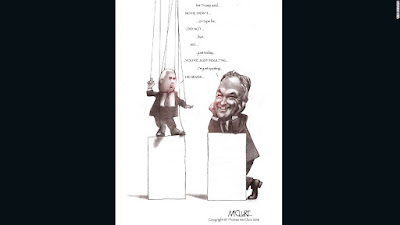 By now we're used to puppet master Trump pulling people's strings. What most people are having a hard time with is interrupting what Chump's tweets or words really mean. Even his appointed Trumpanzees make mistakes when trying to put a logical spin on something Lump lies about. The first among Rump's puppets, Vice President Pence, is finding out that he's also signed on as an interrupter. During an interview with Bill O'Reilly Frump compared the U.S. to Russia claiming the two countries are alike. Bump's comment ended up putting Pence on the defense when reporters asked what Donny Little-Hands meant? Appearing on NBC's "Meet The Press," he denied that Trump was trying to draw a moral equivalency between Russia and the U.S.
First Puppet Pence had to explain to us that, "What you're hearing is a determination by the president of the United States not to let semantics or the arguments of the past get in the way of exploring the ability to work together with Russia and with President Putin in the days ahead." No. What I, and the rest of the world heard, was a U.S. president putting his country on a moral equivalency to the dark empire Russia. Even the gutless Senate Majority Leader, Mitch McConnell, rebuked the assertion. "No, I don't think there is any equivalency between the way the Russians conduct themselves and the way the United States does," he said in a recent interview. But Pence is sticking to his interruption of his master's words like a loyal dog...or a good first puppet. He's followed by Kellyann Conway and Sean Spicer, two puppets that also know how to spin the Donald's ignorant comments. Like millions of other people, I know that when Rump says something, he means it. Regardless of how hard his loyal puppets try to spin his words into something acceptable.